One of the most destructive diseases of the gum and bone that supports the teeth is gum disease. Gum disease is initiated by bacteria, yeast, and viruses that live in the mouth or are acquired through salvia from someone else. So how can modern advances in dentistry help to diagnose and treat gum disease? From multiple scientific studies, it is widely understood that about 10 to 15 bacteria, along with other yeast and viruses (pathogens), are mainly responsible for gum disease. Often the pathogen types and even the combination of pathogens causing the disease are different for different people. What makes this disease even more unique is that everybody has their own personalized reaction to the pathogens. This personalized response is based on individual genetics and lifestyle. A few examples of a much more extensive list of lifestyle issues that shape the personalized response are smoking, sleep apnea, nutrition, genetics, hydration, and even exercise. So, bacteria (pathogens) must be present, but it is a unique personalized response that determines the expression, and ultimately the damage from the disease. 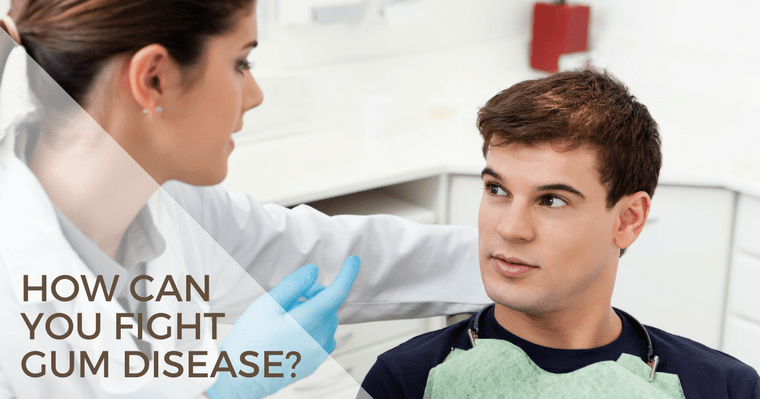 Since many of the genetic and lifestyle factors affecting the disease are difficult to treat, one of the things progressive dentists focus on is controlling the pathogen population. A newer idea in disease management is to identify the pathogen population and use targeted therapeutic strategies to reduce the bacterial load. Now dentists can use a 30-second rinse and spit test to identify and measure, the bacteria, yeast, and viruses using salivary diagnostics. Saliva contains many bacteria, yeast, and viruses, that typically live in and around the teeth and in other areas of the mouth. Since the 10 to 15 bacteria, and specifically, one type of yeast responsible for periodontal disease are known, their DNA can be identified through a sophisticated process that is normally reserved for forensic scientists at crime scenes. This pathogen DNA analysis (salivary diagnostics) is available, affordable, and reliable. As the technology is expanding it is also used to identify and treat other diseases as well. Again, salivary diagnostics provides useful information for dentists that comprehensively treat oral infections. Knowing the quality and quantity of the bacterial load allows the dentist to identify the baseline population of bacteria at disease identification. It allows the dentist to see the differences in pathogen profiles between the disease presentation and when the disease is stabilized. It also allows the dentist the ability to monitor the bacterial load over time to ensure that the disease stays stable. Salivary diagnostics is 21st-century science that can also be used for many other things in medicine. Your Issaquah dentist has an increasing role, and new tools, in the identification of pathogens that can be harmful to your mouth and to the rest of your body. Dr. Vanama utilizes salivary diagnostics in the management of gum disease. See your Wellness dentistry network member dentist, Dr. Vanama for an evaluation of the pathogens that could be negatively affecting your mouth and your overall health. Request an appointment today! See our article in the October issue of Connections, a monthly community newspaper published by Issaquah Highlands Council.